First, we have to say that earlier that day, we solemnly and ritually closed our existing labyrinth of love and creation. It was built three years ago, as a seed of the entire ‘city’ that grew next to it. Hundreds of people walked through it when they visited the Centre. The energy and intelligence set in motion was felt the entire time. Even now, when it has fulfilled its mission, there is ‘something’ that remains in its place. Something that will be felt for a long, long time to come. It was closed by the members of the neocultural community in an appropriate way. Every labyrinth is in a way alive and has a specific role. When it is being moved or closed, this has to happen with due respect. So, let it be noted that we are grateful and honoured to have used its energy and strength and that guided by it we have managed to turn a much bigger project into reality. All that this labyrinth was is now transfused into an incredible centre of energy and intelligence – into our forest city of labyrinths. People began gathering up around 3 pm. Parking problems due to such a large number of people were successfully solved. Little by little, and over a hundred people gathered in the Centre, from all over Croatia, but also Slovenia and Bosnia and Herzegovina. The positive atmosphere was all about the labyrinths. Aside from the real ones, that you walk through, the entrance was surrounded by posters of all nine labyrinths (in addition to the tenth, special Ganeš labyrinth), extremely beautiful pendants that can be used as a preventive measure, and wooden plates for passing through the labyrinths with only fingers and other smaller forms of labyrinths. The gathering begun by a presentation of the Art of Giving association by its president Aleksandra Hampamer. Aleksandra presented a review of the work by the Association together with different humanitarian and other activities in which we took part over the last years (constant activity „a small toy for a big child’s smile“, taking part in welfare for the socially disadvantaged families, help for animal asylums in Zadar, Benkovac, Čakovec and other activities). For an event this big we invited representatives from the local and county administration. The first one to talk to the people present was Mr. Franjo Kovačić, the head of Gornji Mihaljevac district, where our Centre is located. His speech was followed by an applause after he explained the doubts of the locals when we opened the Centre four years ago, but also their acceptance after they saw that, according to him, we were ‘peaceful and good people who are constantly building and working on something’. Mr Kovačić wished us a lot of success in our work recognizing the city of labyrinths as a contribution to our tourist offer and an ecological consciousness of the entire area. The head of the county of Međimurje, Josip Posavec was, of course, also one of the guests, together with his wife Dijana. In his address to the audience, he was equally positive. He said it was his honour to open such a unique project, one of a kind worldwide. He received a big applause from the audience when he made a joke that now the district of Gornji Mihaljevac had twelve villages and one city, which is also something quite unique in the world! After this, Adrian held a presentation explaining the notion of labyrinths, their origin, way of application and effect. He explained the purpose of a ”city of labyrinths” as a balancing factor in the energy and intelligence of the collective consciousness of the entire humankind. Adrian expressed his hope that, even though it was opened in a small, and in world dimensions almost invisible place, the city of labyrinths would have its influence in the years to come and would contribute to a positive resolution of the crisis the humankind is currently in. After the lecture in the Centre hall, everyone went outside the city of labyrinths’ gate where Mr. Posavec formally cut the ribbon and officially declared the city of labyrinths open. However, we still had the most important, ”ritual” part of the opening. Each labyrinth was opened individually. As the originator and the initiator of the idea, Adrian was the first one to pass, followed by a person who read a specific text according to the meanings of the labyrinths. Once they reached the centre, the reader remained there and continued to read the text, while Adrian announced the labyrinth open upon exiting it. After this, everyone else passed through the opened labyrinths enjoying their effect. As for a music background, young flautist Laura fit in perfectly, with Ivančica on percussions. The sound of the flute echoed through the forest turning people not only towards the centre of the labyrinth but also towards themselves. Many expressed their gratitude and admiration of the force of the entire labyrinths’ system, ecstatic they could be a part of such a huge and significant event. The ritual opening lasted for around three hours. Night had fallen in the meantime, and lanterns that has been prepared beforehand gave a literally fairy atmosphere to the entire event. It was really impressive to see the lights moving around the forest, with that many people and the sound of the flute in the air. There was a bit of rain, but the tree tops protected the walkers, so they did not even need an umbrella. Truly, tears of joy from the sky saw off the opening of the city of labyrinths. At the end, we convey you Adrian’s words connected to the opening of the city of labyrinths: „the meaning of the city of labyrinths is global, planetary. Yes, it is true it has been built in a small village located in a small county, in a small and seemingly unimportant country. However, on the level on which the labyrinths work this is not important at all! They now exist on this planet, on this level of reality, in a material form. Their action is not meant to salvage something – nothing and no one can save this world (and its people) aside from the world itself (and especially its people). But, in this time of transformations that can easily turn into chaos, we need balance from an inner level. We need an invisible balance, background of a light we can build our future on. The existence of the city of labyrinths does precisely that! Without it, chances for a positive transformation of the entire world would be significantly smaller. Its greatest value is in the fact that most people do not even have to know about it. In order for the labyrinths to work on a global level, they need the attention of a relatively small number of people – maybe a few hundreds, or, in worse case scenario, a few thousand. And there are that many of us, aren’t there? Surely that many people will hear about the city of labyrinths. Hundreds of them will most probably pass through it. 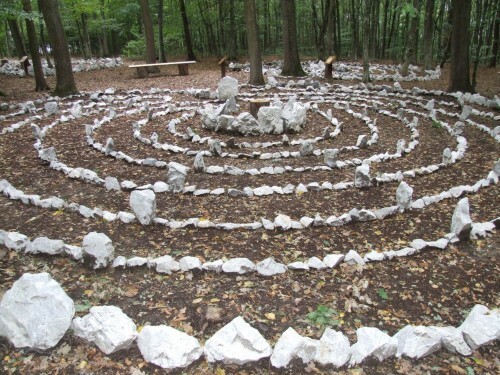 Members of the Art of Giving association, as well as the participants of the Spiritual Academy will regularly pass through the labyrinths. The members of the neocultural community and their sympathizers will take care of the labyrinths and keep them prepared for others. Many will come from afar just to see, feel and walk through the labyrinths. This way, they will do most good to themselves. Still, at the same time they will add new strength to the labyrinths and their effect on the entire world. One person who passes through all nine labyrinths at the same time has added so much light into this reality, which is something thousands and thousands of others will never find out! Personally, I am extremely happy that this project has been realized. Looking at my life mission, I can really say that this is one of its most important parts. Up to now, valuable knowledge about personal development has reached over a hundred thousand people through books and lectures. However, the ”city of celestial labyrinths” has another ”weight” – a global role that most people find unforeseeable and which could possibly remain unknown and unrecognized.